To determine factors predictive of visual outcomes in eyes treated with intravitreal aflibercept injections (IAIs) for typical neovascular age-related macular degeneration (AMD) or polypoidal choroidal vasculopathy (PCV). Retrospective, multicenter, institutional, consecutive, interventional case series. One hundred nine eyes (107 patients) with treatment-naïve neovascular AMD at 3 university hospitals were studied. After a loading phase of 3 monthly 2.0-mg IAIs, injections were administered every 2 months. The baseline clinical characteristics were investigated in relation to the 12-month visual outcomes. Changes in the mean best-corrected visual acuity (BCVA) were measured at 12 months after initiation of aflibercept therapy. Forty-five eyes (41.3%) had typical neovascular AMD, and 64 eyes (58.7%) had PCV. The changes in the mean BCVA at 12 months compared with baseline did not differ significantly (P = .737) between the 2 groups. Stepwise analysis showed that larger gains in the BCVA at 12 months were associated with poor BCVA (P < .001), no pigment epithelial detachment (P = .004), and subretinal fluid (P = .039) at baseline in eyes with typical neovascular AMD; larger gains in the BCVA were associated with poorer BCVA (P < .001), presence of choroidal vascular hyperpermeability (CVH) (P = .013), and subretinal fluid (P = .044) at baseline in eyes with PCV. 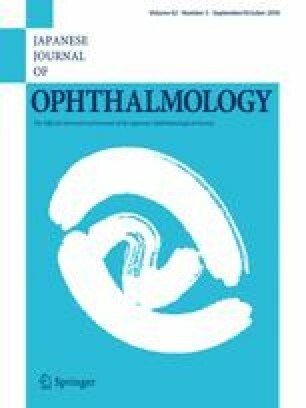 Although poorer BCVA and the presence of subretinal fluid predicted larger gains in BCVA in both subtypes treated with aflibercept, eyes with typical neovascular AMD had greater improvement if no pigment epithelial detachment was present, while eyes with PCV had greater improvement if CVH was present. M. Ogasawara, None; Hideki Koizumi, Grant (Novartis Pharma), Moderator fees (Alcon, Bausch & Lomb, Bayer, Canon, HOYA, Kowa, NIDEK, Novartis Pharma, Santen Pharmaceutical, Senju Pharmaceutical, Topcon, Wakamoto Pharmaceutical); A. Yamamoto, Lecture fees (Bayer, Novartis Pharma, Pfizer, Santen Pharmaceutical); K. Itagaki, None; M. Saito, Grant (Bayer, Novartis Pharma, Santen Pharmaceutical), Moderator fees (Alcon, AMO, Bayer, HOYA, Novartis Pharma, Santen Pharmaceutical, Senju Pharmaceutical); I. Maruko, Moderator fees (Alcon, Bayer, NIDEK, Novartis Pharma, Santen Pharmaceutical, Topcon); A. A. Okada, Grant (Bayer, Mitsubishi Tanabe Pharma), Advisory board fee (Bayer), Consultant fee (XOMA), Lecture fees (Bayer, Novartis Pharma, Santen Pharmaceutical), Research funds (Bayer, Mitsubishi Tanabe Pharma); T. Iida, Grant (Bayer, Nidek, Novartis Pharma, Santen Pharmaceutical), Lecture fees (Bayer, Novartis Pharma, Santen Pharmaceutical); T. Sekiryu, None.